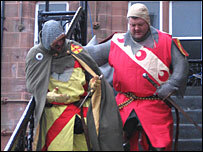 Dumfries town centre has been taken back in time 700 years to witness an historic bloody murder. The re-enactment saw Robert the Bruce slay the 'Red' Comyn - nobleman John Comyn - on the steps of the Midsteeple. 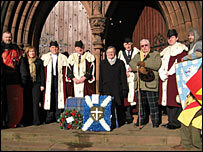 A wreath was also laid at the town's Greyfriars Kirk to mark the 700th anniversary of an event said to have set Scotland towards independence. The weekend event was organised by the Bruce Trust, dedicated to promoting the memory of Robert the Bruce. On a bitterly cold day, Nithsdale re-enactment group the Guardians of the Realm - with help from colleagues from Fyre and Sword - brought the scene back to life. On the steps of the Midsteeple, Bruce called for Comyn's support to become king. When this failed to materialise, he murdered him before fleeing the scene. Crowds watched as Sir Roger Kirkpatrick then charged up the steps to "mak siccar" that Comyn was dead. Two re-enactments took place with an estimated 2,000 people turning out to watch the events which concluded with fireworks on the Whitesands. Special presentations in Greyfriars Kirk throughout the day were also well attended. "I think it probably went better than we could have hoped for," said trust spokesman Doug Archibald. "We are really pleased with the way that it went. We did it all on a wafer-thin budget and relied on a lot of good will."